After the previously posted summary section of this review (pt 1), I've framed the critical evaluation of Schreiner's work (pt 2) using some of the key attributes of the book itself. Schreiner's work can be categorized as Confessional, Canonical, and Pastoral. Within the discipline, Schreiner’s volume represents a thoroughgoing confessional approach from an evangelical perspective. He states clearly that he believes Scripture is the very word of God and that its purpose is to make God known (886). Drawing on his theology of the Holy Spirit, he confesses that all of Scripture is inspired by God and therefore authoritative (e.g., 445). 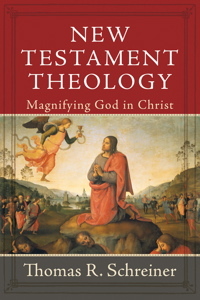 Consequently, Schreiner strongly holds that “it really is possible to write a NT theology” (888). Though there is genuine diversity within the New Testament documents, there is also a substantial unity present that renders them coherent in light of each other. Recognizing the impossibility of doing theology without presuppositions, Schreiner writes from the perspective of one who perceives “the entire canon as God’s authoritative word” (888). He views the task of New Testament theology as one that seeks to convey what is theologically normative. Thus, it is not a purely descriptive pursuit. Rather, it understands itself as re-presenting the words of God in an understandable format. This confessional stance resonates with a number of critical decisions Schreiner makes. Throughout the volume, he operates with a consistent but not unthinking hermeneutic of trust. For instance, Schreiner accepts all thirteen Pauline epistles as authentic and from the hand of the historical Paul. He also argues that the Fourth Gospel was written by the apostle John and is soundly historical. Schreiner sees a fundamentally compatible relationship between John and the synoptic gospels. In relation to the historical Jesus debate, Schreiner accepts the canonical portrait of Jesus found in the Gospels. The theology of the Gospel writers is based squarely upon the teaching of the historical Jesus. Thus, Schreiner does not preclude the possibility of miracles in the ministry of Jesus. He consistently argues for a high Christology throughout the New Testament, including the Gospels. For him, the Jesus of history is clearly the Christ of faith. He also adopts a Trinitarian framework in his discussion of the God of the promise and in his understanding of the mission of God in redemptive history. This affirmation of the Trinity complements his strong view of God’s sovereignty and providence. In one sense, Schreiner’s work is also canonical. Because he accepts the authenticity of the sixty-six books of the Protestant canon, the scope of Schreiner’s work includes the entire New Testament. While Schreiner delineates the distinctive voices of the New Testament, he also takes care to bring them into conversation with one another. Further, the Old Testament plays a foundational role in much of Schreiner’s discussions, functioning as a consistent “backdrop” to his surveys of the New Testament landscape. Though Schreiner readily interacts with extrabiblical literature (e.g., writings from the second temple period), most of his content analysis is limited to the canonical Old Testament and New Testament texts. In this regard, Schreiner is also keen on the way New Testament authors make use of Old Testament material. For instance, Schreiner traces the implications of the fulfillment formulae in Matthew’s gospel (73ff). For Schreiner, the New Testament writers interpret the Old Testament texts they cite in a legitimate and hermeneutically sophisticated way. Though they appropriate some techniques from their Jewish interpretive milieu, they are ultimately guided by the Old Testament context from which they are drawing. For Schreiner, much of the seeming discontinuity present in certain intertextual references to the Old Testament can be explained when one recognizes that New Testament authors understood the fulfillment of some prophecies in a typological manner (e.g., 497). Despite this canonical impulse, Schreiner does not provide much discussion of the shape of the New Testament canon. Neither does he treat issues of canon formation or the material implications of the New Testament groupings. Thus, Schreiner’s work is canonical, in that it limits its major discussion to books that became part of the canon, but he does not reflect much on the formal interrelationships between the New Testament corpora. An omission of this type of discussion is standard fare in works of New Testament theology. However, recent renewed interest in canon studies in both Testaments may eventually demonstrate that the shape of the New Testament canon is relevant to the shape of a New Testament theology. Schreiner seeks to proceed inductively so that his work might be “anchored by the text” (9). He wants to avoid “deriving [his] outline or general train of thought from others” (9). This intention is admirable, and the legion of parenthetical Scripture references attest to the fact that Schreiner has succeeded in weaving a good deal of textual real estate into the pages of this volume. However, some might be disappointed that Schreiner did not tie his outline a little more closely to the structure of the New Testament itself. Indeed, one might argue that the overarching shape of the New Testament canon generates a sufficient narrative framework in which to present its unified, coherent message. The New Testament begins with the beginning of Jesus’ ministry in the Gospels, ends with a glimpse of the end of days in the book of Revelation, and is held together conceptually by a book describing the Acts of the Apostles who wrote letters to the churches. This macrostructure could provide at least a rudimentary “storyline” in which to fit the theology of the individual writings. Even these simple contextual observations might provide the type of cohesion that Schreiner finds lacking in a book-by-book approach. Schreiner has produced a valuable and edifying resource that will be especially useful to those who share his evangelical convictions regarding Scripture. Schreiner’s intended audience is “pastors and students” (9). Evangelical pastors will appreciate his interaction with critical issues and his able defense of many conservative positions. His central thesis is also encouraging for those in the church looking for an energetic articulation of what the New Testament is really all about. Students who have read other New Testament theologies will benefit from exposure to a thematic and inductive approach with a sustained thesis throughout. Because most of the traditional biblical-theological categories and themes are treated at some point, this volume would be a worthwhile addition to a New Testament survey course syllabus. Both students and pastors alike will appreciate the fresh way Schreiner has framed some of the traditional discussions in New Testament studies. The size of this volume may force a number of those in the target audience to utilize it primarily as a reference work. Readers will also need to piece together discussions spread throughout the book to get a full picture of the theology of an individual writing or grouping. This feature is understandable given the format but also means the Scripture and subject index will probably need to be heavily utilized. Schreiner’s excellent summaries at the end of each major section within the chapters will significantly aid those using the volume for this purpose. In this particular case, the value of the work outweighs its price. One final observation relates to the relationship of Schreiner’s thesis to the content and tone of the book itself. Schreiner successfully demonstrates that the purpose of the New Testament is to magnify God in Christ. It is clear in a number of places throughout the volume that Schreiner has written this New Testament theology for that distinct purpose as well. He transparently seeks to magnify God in Christ and bids his readers to join him in this pursuit. Here we see Schreiner taking up the role of pastor as well as professor. An edited form of this review appears in Horizons in Biblical Theology 32.2 (2010), 237-40.